During summertime, the sun is shining, the skies are bright and blueberries are ripe for picking. There are many opportunities to select your own fresh berries from local growers, and there is no shortage of interest in this activity. The Oregon Blueberry Commission's website notes that in 2017, 9.9 million pounds of blueberry on-farm sales were made. 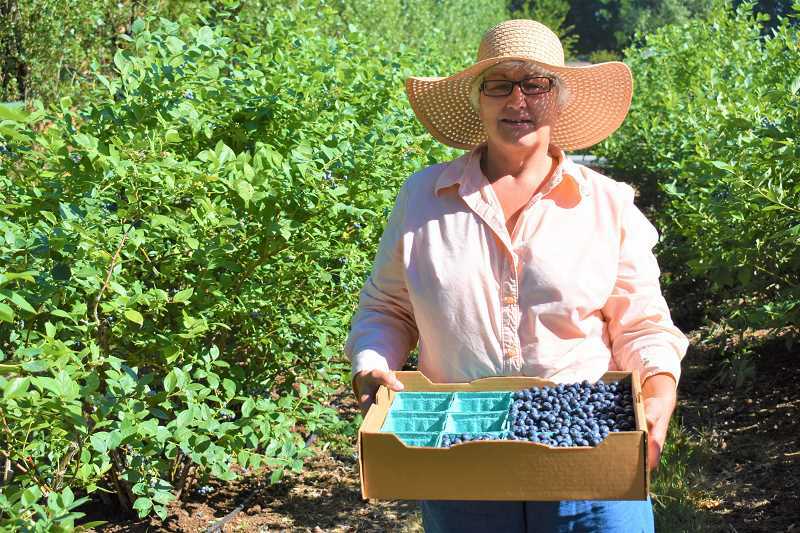 There are several blueberry growers in the Estacada and Eagle Creek areas, including Lina Davis of Davis Farms. Lina and her mother, June, purchased the farm at 40860 S.E. Kitzmiller Road several decades ago. "Mom and I had been looking for a place to buy together, and she was always a berry picker," Lina said, noting that the property was already established as a blueberry farm when they purchased it. Though June passed away six years ago, Lina has continued running the farm with her partner, James. The operation spans one acre and has approximately 760 blueberry plants. Varieties of the fruit include early blues, jubilees and dukes. This year, the harvest season began in June and will continue through late August. Davis Farms gives attendees the opportunity to pick their own blueberries or will pick berries for their customers. Most of the sales come from people who have opted to find their own fruit. Berries are $2 a pound for self-picking or $3 a pound to have them picked. There are buckets for picking the berries, and to take home the fruits of their labor, customers can bring a container or purchase a cardboard crate for $2. Lina appreciates connecting with the farm's visitors when they stop by. "We have lots of regulars. We get locals, and ones who come back every year," she said. She added that they are eager to connect customers with berries. "This year we're loaded. It's a great crop," she said. She also strives to provide a personalized experience for the farm's guests. "We try to be friendly and help in any way we can," she added. When picking blueberries, Lina encourages customers to notice everything around them. "Look high, look low. They're everywhere," she said. "The good ones seem to be in the most inconspicuous places." She added that there are many perks of selecting fruit directly from a farm. "You know where it came from. You know it's clean and it's fresh," she said. "It's fresh to your mouth right off the bush." For Lina, working with the blueberry plants over the years has been an interesting educational experience. "I've had to learn a lot, but you learn as you go," she said. "I was dropped into it, but I grew up on a livestock farm. I've learned to do all kinds of stuff I never thought I'd be doing." She added that managing a blueberry farm is more work than it might seem. "People think you just plant them, but there's a lot of work involved in making them productive and look nice," she said, noting that the off-season involves pruning, mulching, weeding and working on the irrigation system. When she's not tending to the blueberries, Lina works as an office manager for West Coast Industrial Lumber in West Linn. Though the farm keeps her busy, the pay off is strong. "We put in a lot of effort and people enjoy eating and baking the berries," she said. She appreciates her customers, as well. "They're so loyal. I enjoy seeing them and catching up," she said. "It's nice to see them every year. "